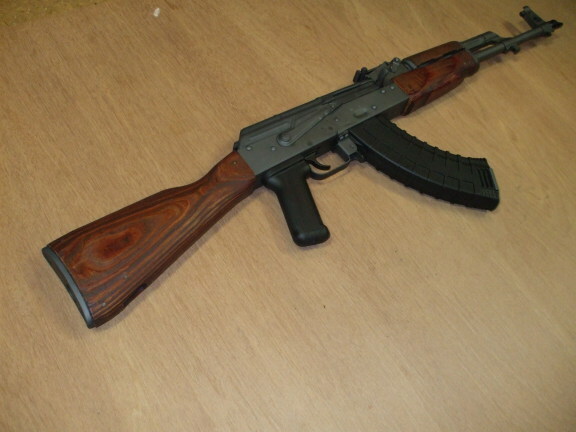 We are finishing our project to build an AK-47 and it is time to assemble all the components. We have built a new receiver by bending a flat into shape, milling its top rails, heat-treating the areas around the rivet holes, and riveting the internal rails and trunnions into place. 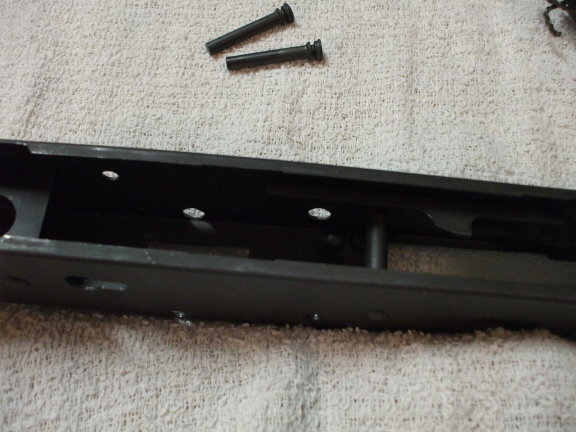 We then parkerized the receiver and all other metal parts. Finally, we restored the wood stock. Now it's time to put it all together. We will start by mounting the barrel to the receiver. 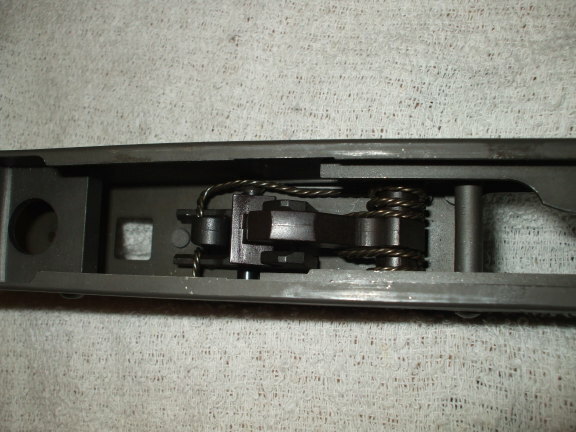 We need to press the slightly tapered chamber end of the barrel into the front trunnion of the receiver. An aluminum block with a 0.25" through hole is placed in the receiver. 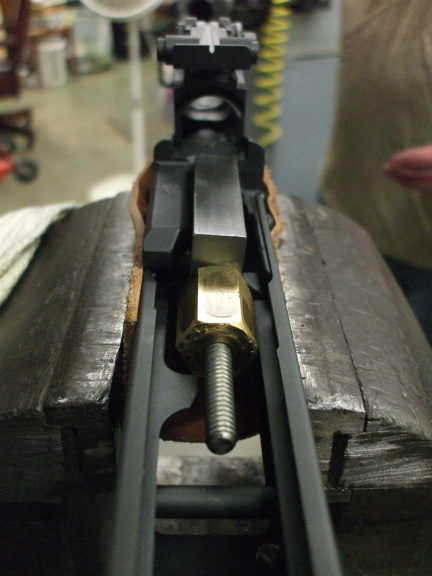 A 1/4-20 threaded rod is placed down the barrel, through that block, and brass plugs are threaded onto either end. We lubricated the unparkerized exterior of the chamber end of the barrel with cocoa butter. 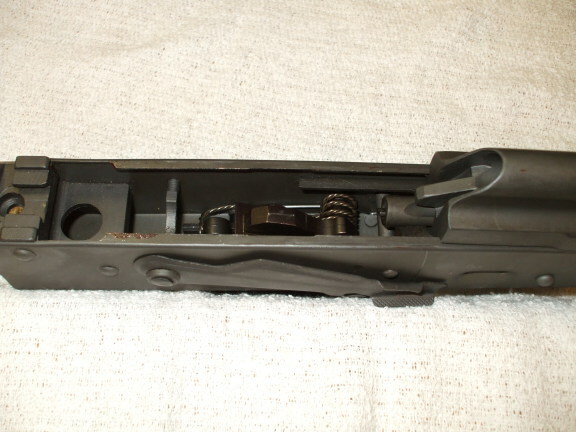 The brass plug at the muzzle end is turned with a wrench to seat the barrel in the front trunnion. The relatively soft brass protects the muzzle. Be careful as the barrel moves into the trunnion. You need to stop when the notch in the barrel is aligned with the hole through the trunnion. 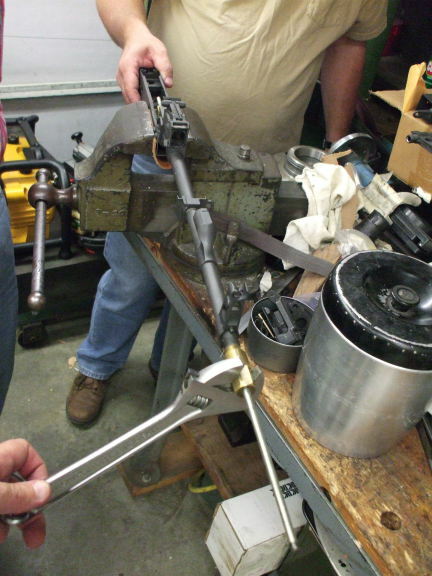 Once the barrel has been pressed into the front trunnion, we used a hydraulic press to push the front trunnion pin into place and lock the barrel into the trunnion. Then we need to assemble the action. 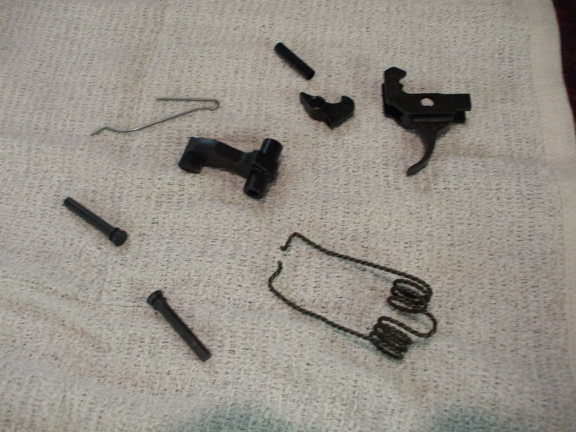 We will use the original hammer spring, but replace the rest of the action with a trigger group parts kit. 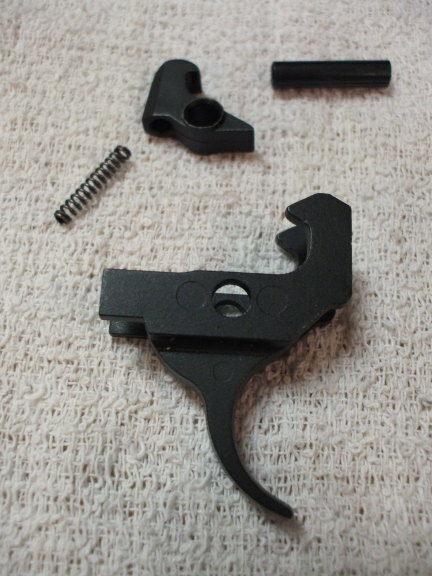 An American made trigger groups gives us some domestic replacement parts for 922 compliance. Available magazines did not quite fit. Surplus steel magazines from the original manufacturers were a little too wide. Polymer magazines from Tapco were a little too long. 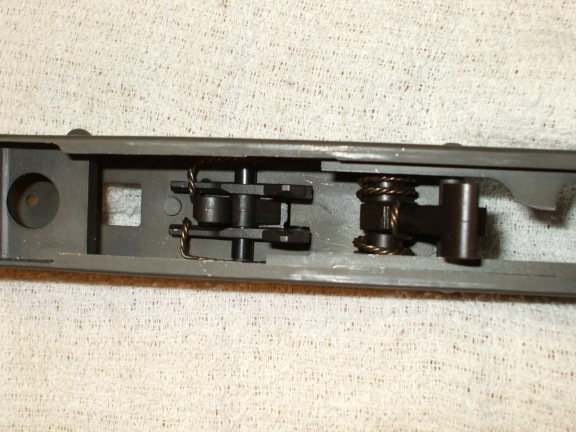 A small amount of steel had to be removed from the rear of the magazine well and the front of the trigger mount. Tapco magazines then fit just fine. The two pins at lower left and the hammer spring at lower right in the first picture are original. 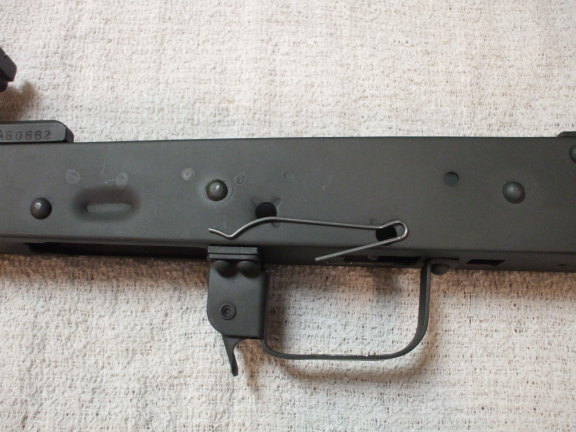 The trigger assembly and retaining clip at top are new. 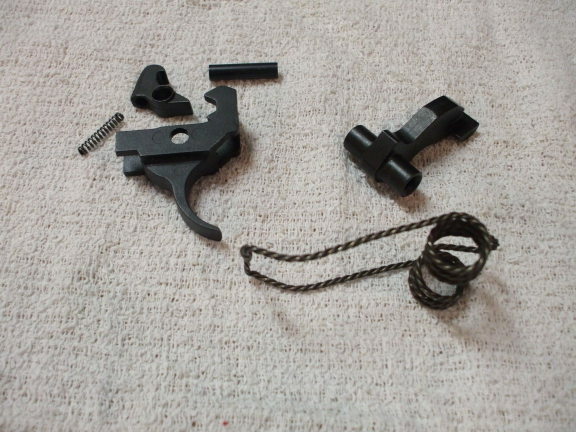 The trigger assembly and retaining clip are from Tapco. The hammer and trigger assembly account for two more U.S.-made parts as required by Title 18 of the US Code, Chapter 44 Section 922 and its paragraph R. Make sure you understand 922r compliance. 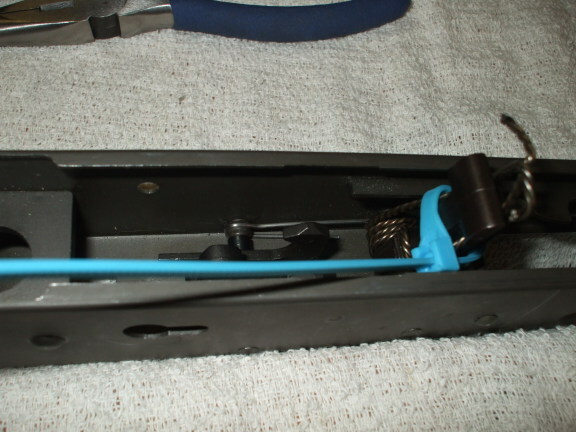 The retaining clip goes inside the receiver against its left wall. The loop goes around the rear pin, and the long front goes under the front pin. 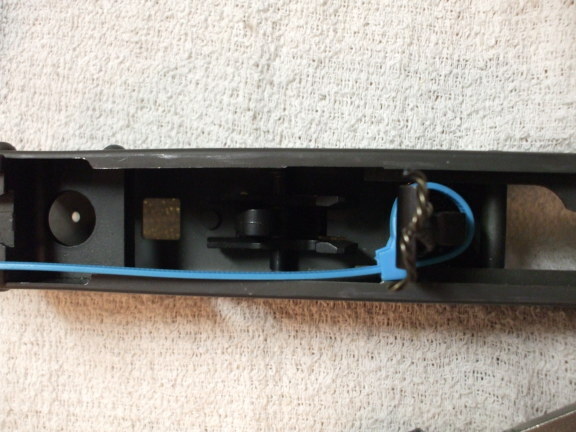 Here it has been laid on the exterior of the receiver to show where it must be installed inside. Put on safety glasses before progressing to this next step! Place the hammer spring on the hammer. Bend the long arms of the hammer spring to the cross arm of the hammer, and hold them in place with a plastic wire tie. Watch out, the hammer spring can be pretty vicious. Here we are looking down into the receiver. The barrel is to our right. 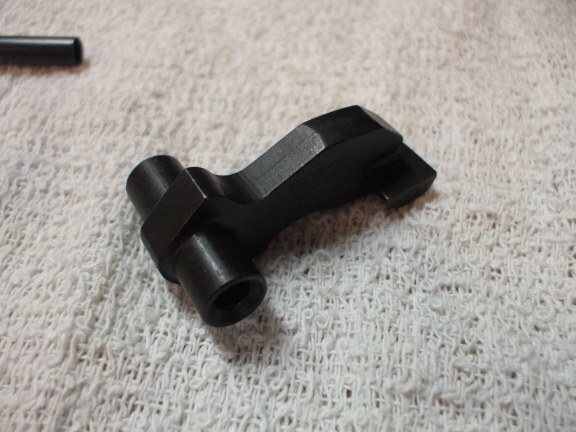 The front pin will hold the hammer in place, and the rear pin will hold the trigger assembly. 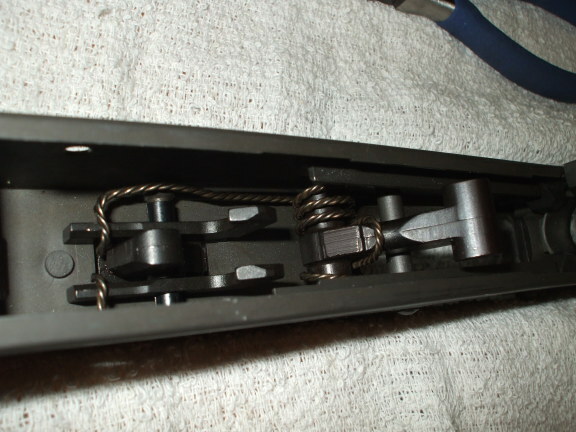 Hold the hammer and its spring in place and push one of the retaining pins through the receiver from the left side. Assemble the trigger components. The tube holds these pieces together, the retaining pin will pass through that tube. 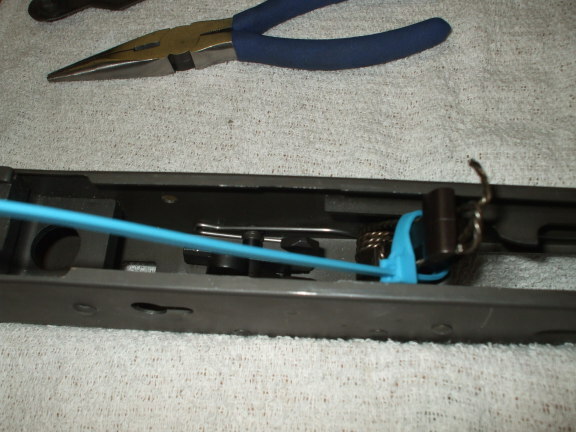 Hold the trigger assembly in place within the receiver and press the retaining pin through the receiver from the left side, so it passes through the trigger group. 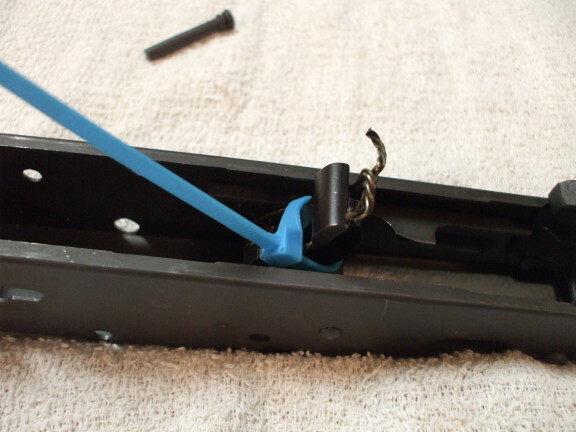 Use needle-nosed pliers to insert the retaining clip into place. It needs to snap into the groove near the broad end of the pin. This groove will be just inside the left wall of the receiver. If the groove is not fully within the receiver wall, then the pin is not yet pressed fully into place. The tip of the pin may be misaligned and not fitting into the smaller hole in the right wall of the receiver. Or the pin simply may not be pressed into place yet. The rim and groove will snap through the left receiver wall. 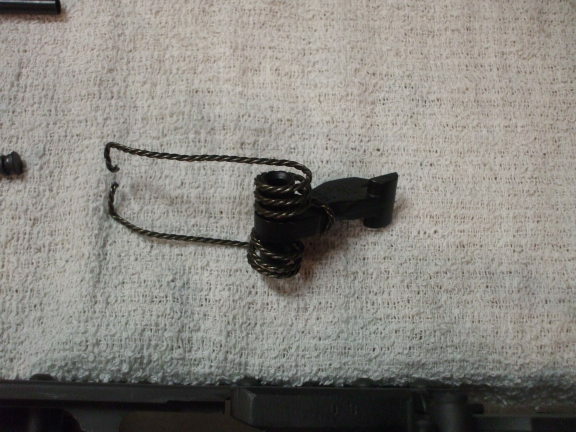 Get both pins snapped into place and the retaining clip properly aligned. Then press it forward into place. I used a wooden chopstick for this. Make sure that you get it pushed all the way forward, so the entire rear loop is seated in the retaining pin's groove. If you don't do this, one or both pins will work loose and the internal works will come loose. The tension of the hammer spring will firmly rearrange the parts within the receiver and function will come to a sudden halt. Once you have the parts installed, cut the plastic wire tie and allow the long arms of the hammer spring to snap into place. You may need to use the needle-nosed pliers to move the hammer spring arms into place on the rear of the hammer. 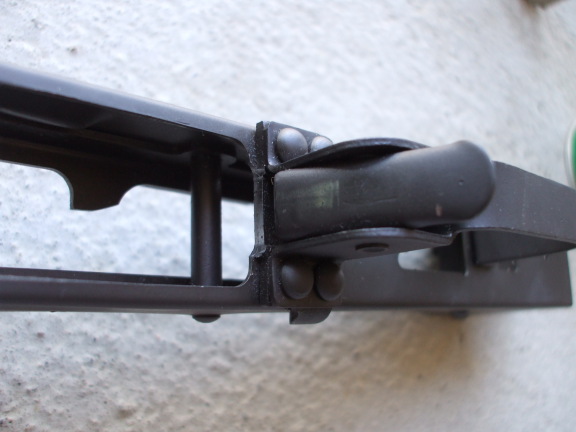 Each spring arm hooks over the corresponding rear arm of the trigger. 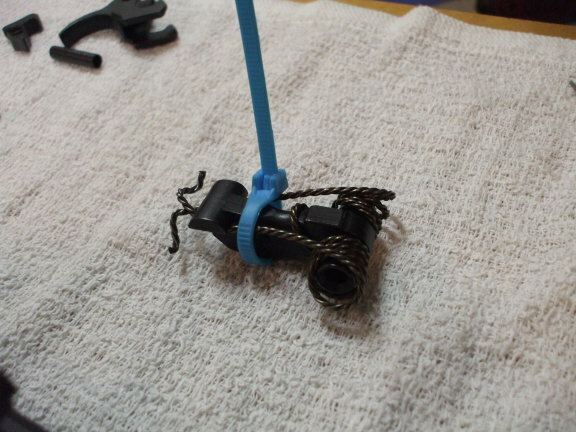 Here we have rotated the hammer back until it is caught by the dual hooks of the trigger. Snap the safety lever into place. With the hammer back, we can install the bolt and bolt carrier. 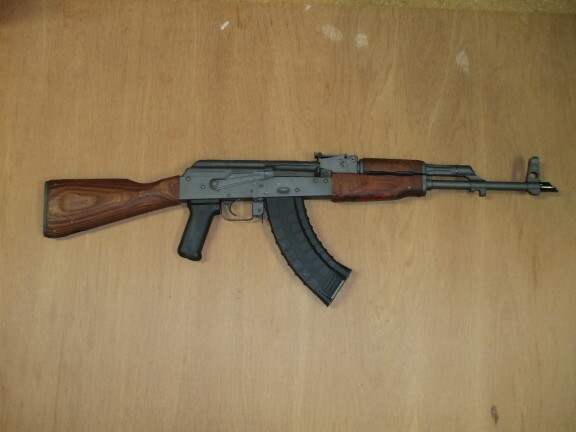 Here is the fully assembled AK-47! We have installed the receiver cover and the gas piston and gas cylinder. If you looked at the page where we restored the wood stock, you will notice that we have removed that rather awkward forward pistol grip on the forestock. We simply cut it off with a chop saw and then smoothed out the grip area on a belt sander. Then another cleaning with brake cleaner, an application of stain, and then rubbing with linseed oil as shown on the wood restoration page. 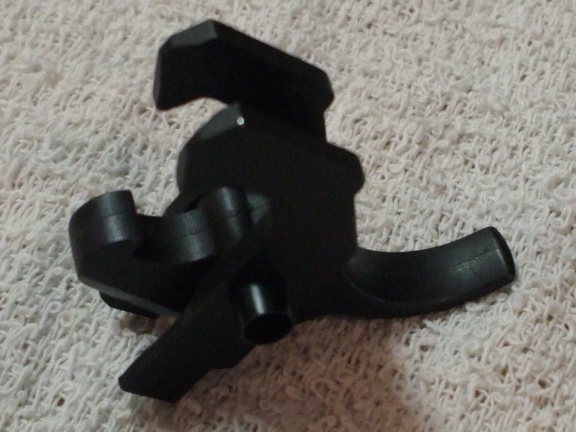 The angled muzzle brake counts for another U.S.-made part, as do the pistol grip and the magazine. For some reason the AK muzzle brake has a left-hand thread. Those three, plus the trigger assembly, hammer, and receiver make for a total of six original parts replaced. Remember that the criteria is not how many U.S.-manufacturered parts you add. Count the number of original parts you replace. You don't get "points" just for adding U.S. parts, or else you could take a completely original gun and add some stickers and tassles. Remove original parts and replace them with U.S.-manufactured ones. 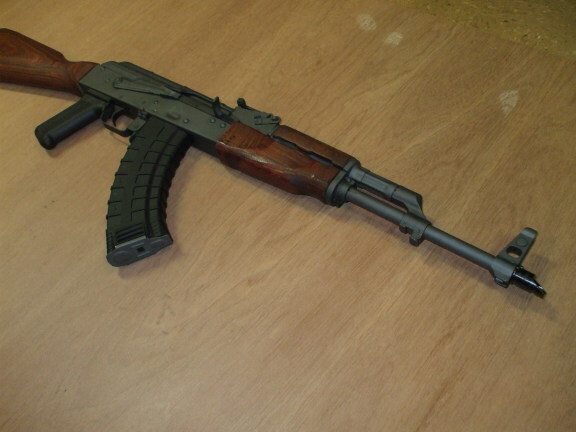 Keep in mind that the point is not to keep you from building or owning an AK-47. The entire point of the BATFE rules is to increase business for U.S. manufacturers of Kalashnikov replacement parts. See the 922R compliance page for further details on keeping your rifle legal.